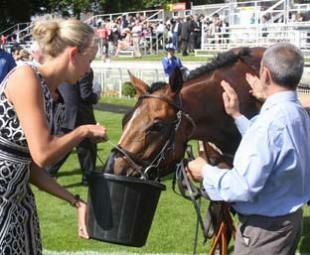 The husband and wife team of Richard and Vicki Fahey claimed the opener on Ascot’s big late July Saturday card with easy winner CASTLES IN THE AIR. The Longines Handicap is one of the major ladies’ races of the year and it was smooth sailing for Vicki to land the third winner of her career as she cruised into the lead at the furlong marker and surged four and a half lengths clear. 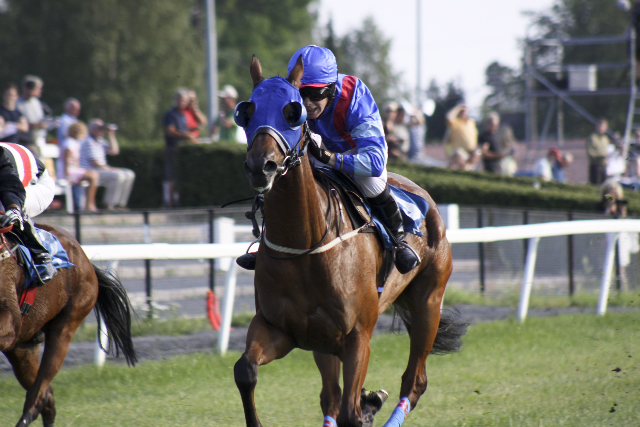 Not to be outdone by her Fegentri male counterpart Ian Chanin, who rode his first Flat winner in Norway at the beginning of this month, our British amateur lady jockey Claire Allen has now ridden her first Flat winner under Rules in Sweden today! 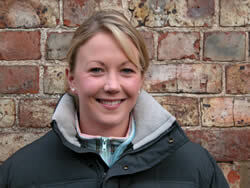 Many congratulations to Claire! A great achievement – this Fegentri season is certainly proving to be exciting for Great Britain! 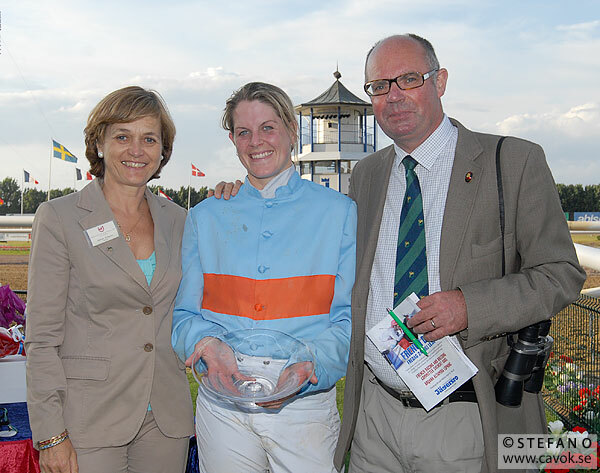 Claire Allen receiving her winning trophy from Nathalie Belinguier, President Fegentri, and Hans Engblom, President of Amatorryttarkluben (ARK), the Swedish Amateur Jockeys Association. Ladies Night at Nottingham on 4th July provided a great stage for a thrilling Fegentri ladies flat race with the finish fought out by GB representative Claire Allen and Germany’s Nadine Gratz, with Nadine getting the upper hand as the post drew close to win by a neck. 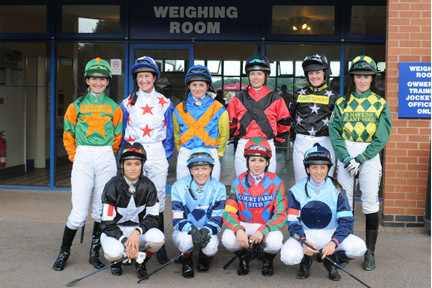 The British team, made up of this year’s GB Fegentri representative Claire Allen as well as Serena Brotherton, Alyson Deniel and Lorraine Ellison, rode against Fegentri lady jockeys representing France, Germany, Ireland, Norway, The Netherlands and Switzerland in a field of 10 runners. 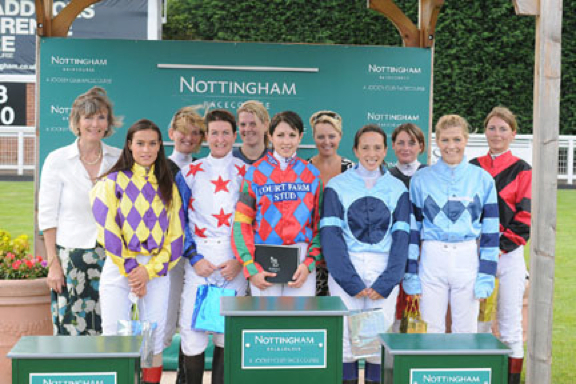 Ireland was third with Clare MacMahon and all the lady jockeys agreed that Nottingham is a great course with a crowd who gave them a wonderful welcome. Left to right: (Sarah Oliver), Melanie Plat (France), Alyson Deniel, Serena Brotherton, Claire Allen (Great Britain), Nadine Gratz (Germany), Emily Jones, Paula Wolters-Flierman (Netherlands), Lorraine Ellison, Catherine Burri (Switzerland) and Cathrine Engebretsen (Norway). A delighted Ian Chanin, our Fegentri gentleman representative for Great Britain this year, experienced a first when riding the winner of the gentlemen’s Flat race in Norway today. 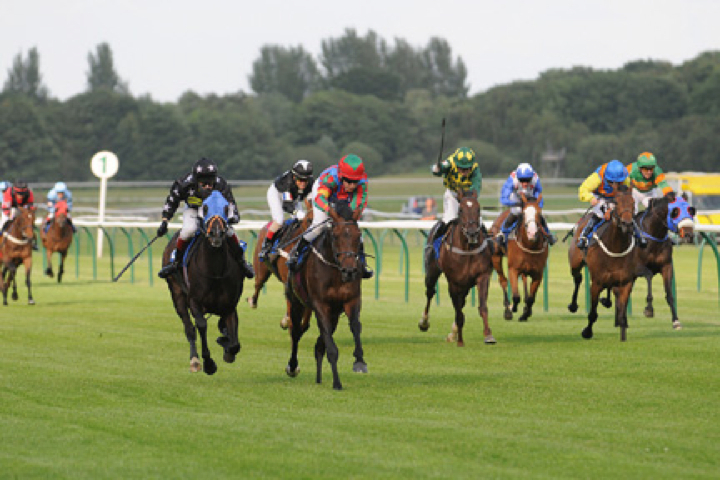 More familiar to the point-to-point winner’s enclosure with over 60 wins so far in his career, Ian has not only had to acquaint himself with the starting stalls but also adjust to a shorter riding style to get the most from his rides. Many congratulations to him!